Vast tracts of rainforest in Brazil are to get a new protected status. The segments of land in the northern Para state together cover 15 million hectares (57,915 sq miles), an area of land that is bigger than England. Thousands of wildlife species inhabit the pristine forest, including jaguars, anteaters and colourful macaws. Campaigners say the decision made by Para Governor Simao Jatene is one of the most important conservation initiatives of recent years. It will protect the land from the unsustainable logging and agriculture practices that have blighted many parts of the Amazon. "If any tropical rainforest on Earth remains intact a century from now, it will be this portion of northern Amazonia, due in large part to the governor's visionary achievement," said Russell Mittermeier, president of Conservation International. "The region has more undisturbed rainforest than anywhere else, and the new protected areas being created by Para state represent an historic step toward ensuring that they continue to conserve the region's rich biodiversity and maintain its essential ecosystem services." Seven new areas will gain protection, and they will link with existing reserves to form a huge conservation corridor in the northern Amazon. This corridor, known as the Guyana Shield region, stretches from neighbouring Guyana, Surinam and French Guiana into Brazil. It is regarded a global conservation priority, containing more than 25% of Earth's humid tropical forests. 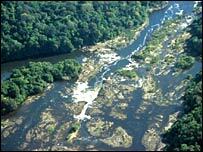 Almost 90% of the Guyana Shield forest is untouched, and the area also contains the most significant freshwater reserves in the American tropics: almost 20% of the world's water runs through it. Endangered species in the new protected areas include the giant otter and northern bearded saki monkey; and "flagship" species such as the jaguar, giant anteater and black spider monkey. Since 1970, more than 600,000 sq kilometres (230,000 sq miles) of Amazon rainforest - an area larger than France - is said to have been destroyed. Conservation International said continued deforestation at this rate would place the entire region in peril by 2050, and place increasing pressure on the planet from the additional greenhouse gasses being pumped into the atmosphere, which would usually be stored by the trees. Adalberto Verissimo, senior researcher at the Amazon Institute of People and the Environment (Imazon), which is working in collaboration with the Para State Government and Conservation International (CI), said: "This is the greatest effort in history toward the creation of protected areas in tropical forests."